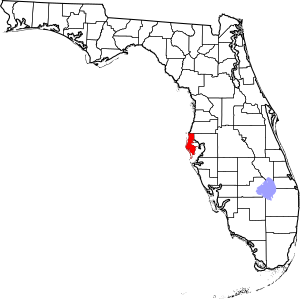 This is a list of the National Register of Historic Places listings in Pinellas County, Florida. This is intended to be a complete list of the properties and districts on the National Register of Historic Places in Pinellas County, Florida, United States. The locations of National Register properties and districts for which the latitude and longitude coordinates are included below, may be seen in a map. There are 68 properties and districts listed on the National Register in the county, including 1 National Historic Landmark. Another 2 properties were once listed but have been removed. (#12000363) 10000 Bay Pines Blvd. (#13000164) 950 12th St., N.
(#13000145) 209 Park St., S.
(#13000034) 1018 Park St., N.
(#14000321) Bounded by Dodecanese & Roosevelt Blvds., W. Tarpon & N. Pinellas Aves. Clearwater Relocated from original address at 1324 South Fort Harrison Street. (#72000348) 01984-10-10October 10, 1984 Dodecanese St.
National Register of Historic Places listings in Pinellas County, Florida Facts for Kids. Kiddle Encyclopedia.